Five cup salad, also known as Ambrosia in some circles, is a staple on our holiday tables. It’s simple to make, requiring only about 5 – 10 minutes prep-time, and it’s delicious, too. The best part about this recipe is that I don’t even have to modify the recipe to make it work for my 30 days of cans challenge because the recipe is made from canned fruit. Basically, you drain a couple of cans of fruit and stir in a few additional ingredients. Store it in the refrigerator for 30 minutes to an hour, and it’s ready to serve. The original recipe calls for one cup of each ingredient, but since leftover canned fruit tends to get lost in the back of my refrigerator, I use an entire (20 ounce) can of pineapple tidbits, and one (11 ounce) and of mandarin oranges. The rest of the ingredients are added with their usual 1 cup measurement. Money Saving Tip: If you are like me and find dried out miniature marshmallows on your shelf because the kids made cocoa and didn’t seal the bag. (Sometimes, it’s not the kids). These desiccated marshmallows can still be added to a fruit salad. The moisture from the fruit brings them back to life as the salad chills in the refrigerator. Just allow them to have about 20 minutes to be re-hydrated before serving. Remember to save the juice from the cans of pineapple and mandarin oranges to make Tropical Fruit Juice Tapioca. Give this recipe for Five Cup Salad a try and let us know what you think by leaving a comment below. Thank you for visiting Patty Cake’s Pantry. 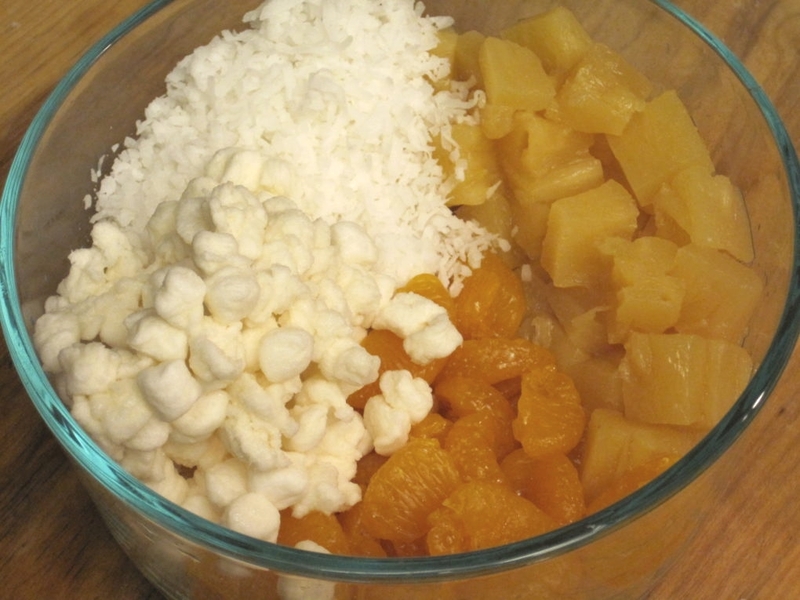 This simple fruit salad recipe comes together in a snap. It's delicious and something that my family loves. Cook's Note: If you want to cut down on the fat calories, you can substitute and equal measure of either plain or vanilla flavored Greek yogurt for the sour cream. Total Cost of Recipe = $3.25 or $0.54 per serving. Drain fruit and place in a 1½ to 2 quart bowl. Add coconut and miniature marshmallows to bowl with fruit. Add sour cream to bowl. Fold sour cream into fruit. Refrigerate for 20 - 30 minutes before serving. 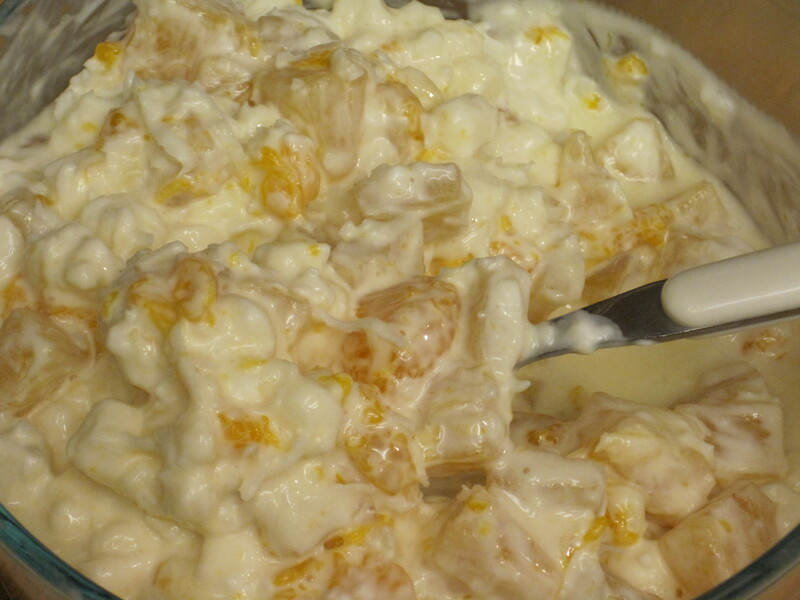 Pattycakes, this recipe really looks delicious and reminds me of my favorite family ambrosia salads. I love how you’re now including the prices of your ingredients. Awesome idea! Thank you. I decided to start adding the price of my ingredients because I know that people are always looking for inexpensive meals for their family. Of course, what I pay in my southern California town may not be what you pay in your town, but I’m still including my costs for each recipe. I hope people find it helpful.